I love this time of year, the air full of the noise of birds and the smell of freshly cut grass, the anticipation of a (potentially) hot summer ahead and the freedom this fun business gives me to enjoy it. However, it doesn’t feel that long ago that I was most definitely NOT in a fun business. I remember staring wistfully out of the office window, suited and booted, watching enviously as people paraded down the high street in shorts and T-shirts seemingly without a care in the world. Obsessively watching daily weather channels along with office conversations full of hope that we may have some sun at the weekend only to be dashed by the UK’s predictable cloud and rain. Or worse, sweltering in an office hoping to make a sprint for it at 5pm only to be caught by the tidal wave of commuters with the same ambition. This time of year also see’s another seasonal change. The wedding season. Many in the events industry will tell you that, due to the crash of 2008, wedding’s now happen more frequently throughout the calendar. This is because many venues suddenly realised they needed to find a more sophisticated approach to getting their main income earners, instead of relying on a frenetic 6 months in the middle of the year. The 2008 recession did wonders for flattening out the calendar and ensuring we can operate our fun business all year round. Venues hustled their way to a full diary by discounting offers in quieter times of the year. It’s worked, but we’re a stubborn lot. You see, we still hope for that summers day event that we’ve seen in the movies and magazines most of our lives. A marquee perhaps, set in grounds by a lake with canapes and sparkly. Guest’s meandering and playing garden games whilst we all sport the radiant glow of several weeks of vitamin D.
It’s compelling. I flew off to get married some 11 years ago in St Lucia to obtain this magical scenario. Not just rained, but when you’re in the Caribbean the rain comes down so hard it bounce’s back up at a surprising height. The combination of high street envy whilst staring out the office window and the picturesque sun drenched pictures touted by every marketing agency on the planet makes the concept of a summer wedding almost impossible to ignore. Whatever the discounted offers created through economical pressures, May through to September will always be part of the romance of weddings. 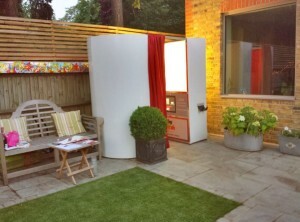 Providing wedding photo booth and party photo booth hire during this time of year is especially enjoyable. We’re fortunate enough to be in a fun business that gets to see the lighter side of an event. We get all the up side. This is why I love the event delivery of the Smiley Booth business. By the time we get to an event the nervous stress and numerous drama’s of the morning preparation for the bride and groom have long been forgotten. The tension of the formal ceremony has been replaced with relief and gratitude that they came through it unscathed. The guests have all arrived, speeches have been completed and food and drink have been consumed in abundance. All that’s left now is to relax and enjoy the party. Oh, and pile into the Smiley Booth Photo Booth to grab that hat and an impromptu photo with Aunt Nelly. It’s an experience I never get tired of. Leaving these events it’s difficult not to feel like a member of the family as people pat you on the back thanking you for the opportunity you’ve given them to connect with old friends and long lost family. I don’t believe theirs another experience out there that brings people together at events in such a way. It’s truly humbling to watch. 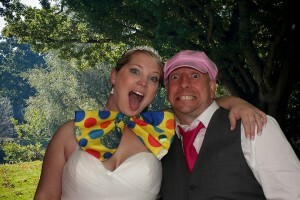 It may be the start of a busy wedding season, but it sure is a fun business to be in. So, whilst I look out the window of my home office, I’m reminded of the grey office and the high street I used to work in whilst employed by “the man” and wonder whether it might be better to work in the garden as the suns come out. Exhibition Success. Why most businesses fail at exhibitions and 6 steps to ensure you’re not one of them.